A brilliant mans card Sylvie. Love the stamp and the papers and cogs really suit him. A super card Sylvie, such a fun image and great masculine design. 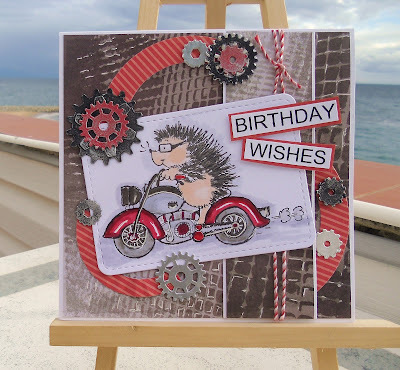 A gorgeous designed card Sylvie, oh what a fab stamp, he’s a real little rocker isn’t he , fab papers and great embellishments. What a SUPER card Sylvia, a fabulous masculine card with all the great details. This is just fab, I love all the cogs and your fun image too.